New lava flows were found on the deep ocean floor during Research Cruise FK151121, conducted 20 November-17 December 2015 aboard the Schmidt Ocean Institute Research Vessel (R/V) Falkor, while exploring 600 km of the Southern Mariana Back-Arc for hydrothermal anomalies (figure 1). Figure 1. Map of the Mariana Islands (right, east) and the back-arc area (left, west), showing previous labeled map segments 1-10 and new latitude-based back-arc segment nomenclature. The new lava flows were found in the 15.5°N segment. 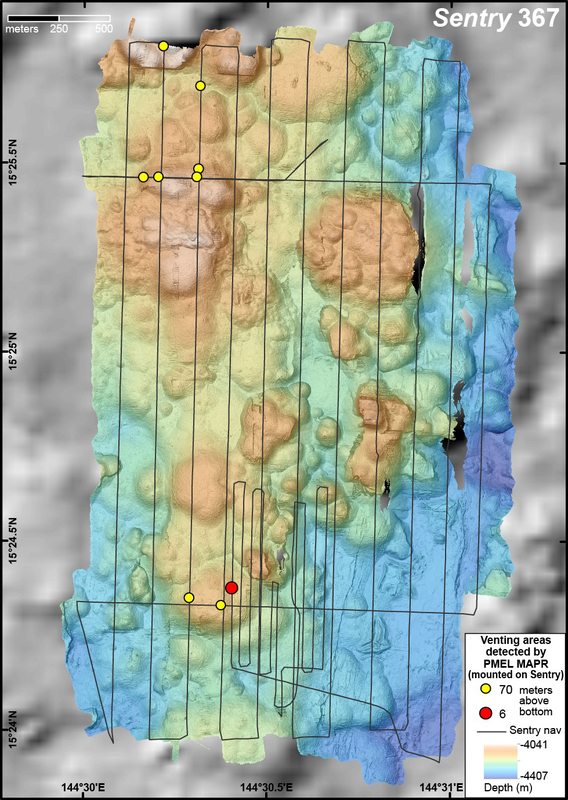 New areas of hydrothermal venting discovered during the 2015 expedition are shown by green dots; white dots are previously known venting sites. From Merle and Chadwick (2016). 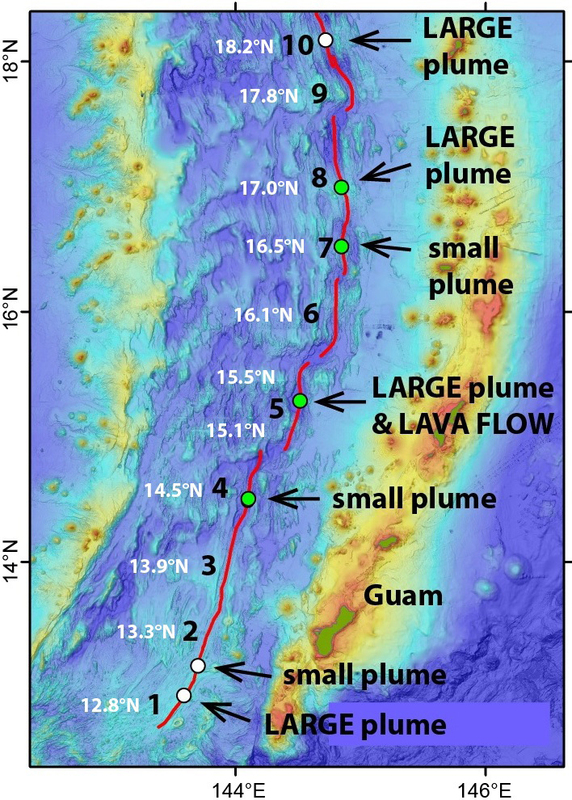 In a brief article by Chadwick, Merle, and Anderson (2016) in the informal cruise report compiled by Merle and Chadwick (2016), the following observation was made: "One of the most surprising discoveries during the cruise was finding glassy unsedimented lava flows on the 15.5°N segment (Map 5), indicating that there had been a recent eruption on this segment." 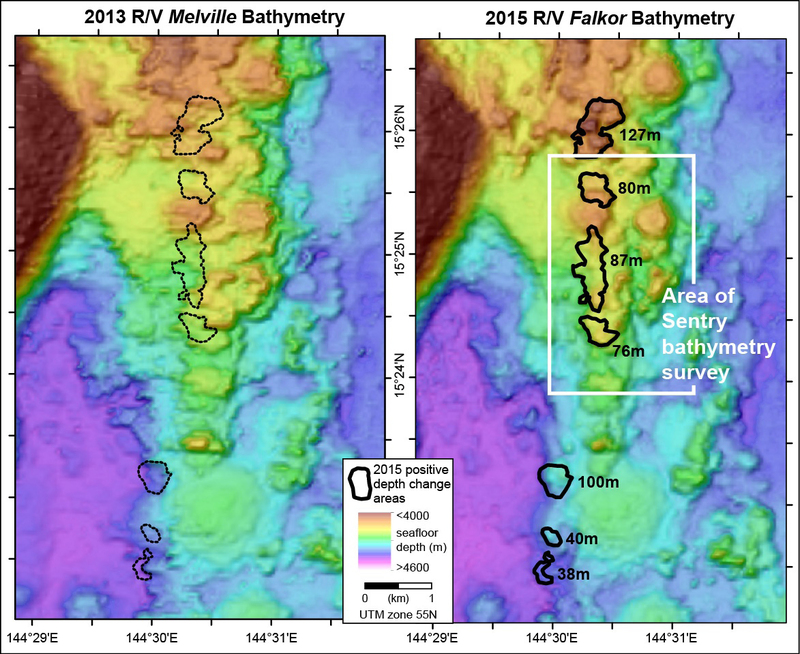 In the report, Chadwick and Resing (2016) opined that "The timing of the eruption can be constrained between multibeam sonar surveys on February 14, 2013, by R/V Melville, and December 1, 2015, when we resurveyed the site with the Falkor." Further, Chadwick, Merle, and Anderson (2016) comment that "However, the very appearance of the lava flows, the lack of sediment, and the hydrothermal venting all suggest the time since the eruption was much less than that - perhaps on the order of months. On the other hand, the lack of hydrogen in the CTD water samples over the site means that the eruption had to be older than a few weeks or a month (and that it was certainly not still ongoing)." 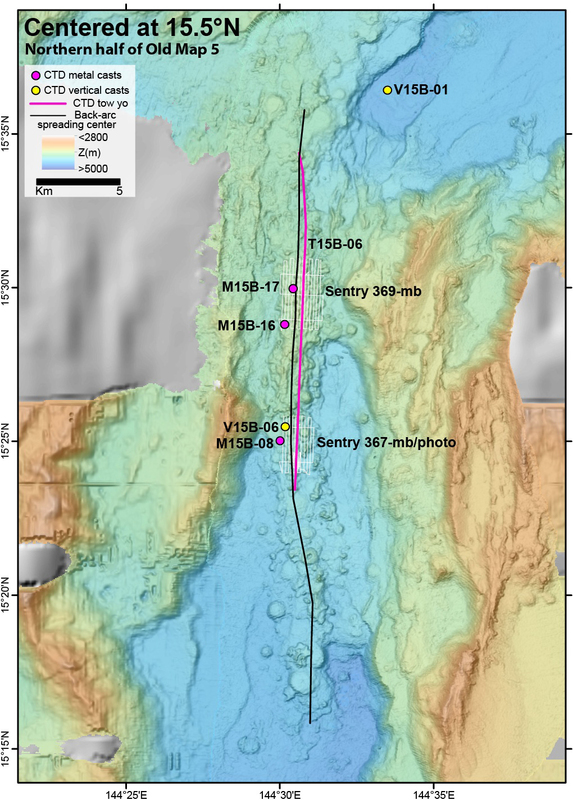 Chadwick, Merle, and Anderson (2016) compared the bathymetry collected by this cruise with multibeam survey data collected over the site on 14 February 2013. This comparison showed that there were seven distinct areas of significant depth changes, ranging from 38 to 127 m (figure 2). "The lava flows extend over a distance of 7.3 km, or from 15° 22.3' to 15° 26.3'N. The cross-axis width of the lava flows is 300-600 m. The depth at the eruption site ranges from 4050 m in the north to 4450 m in the south." Detailed bathymetry of the area with the new lava flows is also available (figures 3, 4, and 5). Figure 2. Outlined areas of significant positive depth changes (from 38 m on the southern-most mound to 127 m on the northern-most mound) between the 2013 and 2015 cruise surveys. From Chadwick, Merle, and Anderson (2016). Figure 3. Bathymetry in the area of the new lava flows. The black line shows the location of the back-arc spreading center, the colored dots show sample casts (CTD: conductivity-temperature-depth), and the red line shows the location of a CTD tow. The location and track of the Sentry 367 dive is marked on the map. From Merle and Chadwick (2016). Figure 4. Enlargement of bathymetry in area of new lava flows showing the survey tracks of AUV Sentry 367 (black). From Merle and Chadwick (2016). Figure 5. Greater enlargement of the bathymetry in the area of new lava flows showing the track of the AUV Sentry dive 367 (red). From Merle and Chadwick (2016). A photo survey dive conducted by the autonomous underwater vehicle (AUV) Sentry in the area showed images of "an amazingly pristine lava flow with dark glassy pillow and lobate lavas with little or no sediment on them" (figure 6). (Note that an AUV is an unmanned robot which travels underwater without requiring input from an operator.) 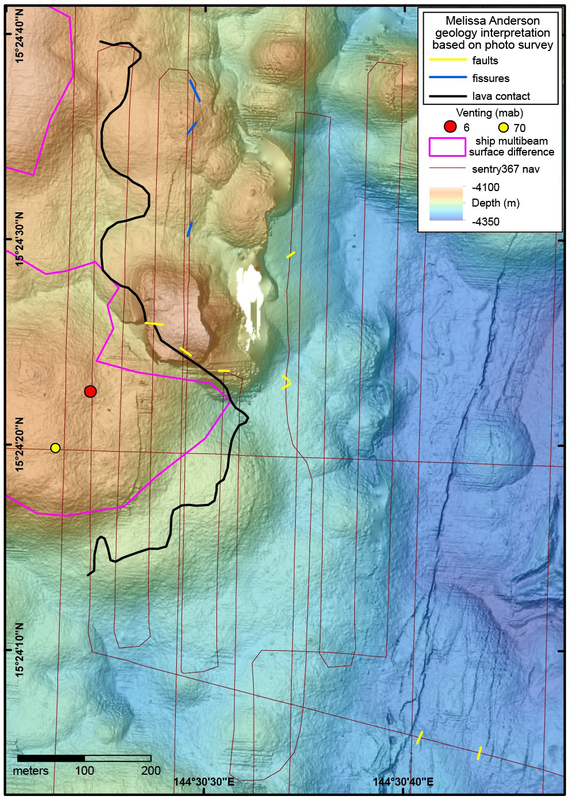 According to Anderson (2016) in the final cruise report, "Between 15°12'N and 15°33'N, the seafloor… is dominated by relatively recent volcanism, manifested by unfaulted hummocky volcanic terrain on the basin floor bound by hummocky old arc crust." Figure 6. 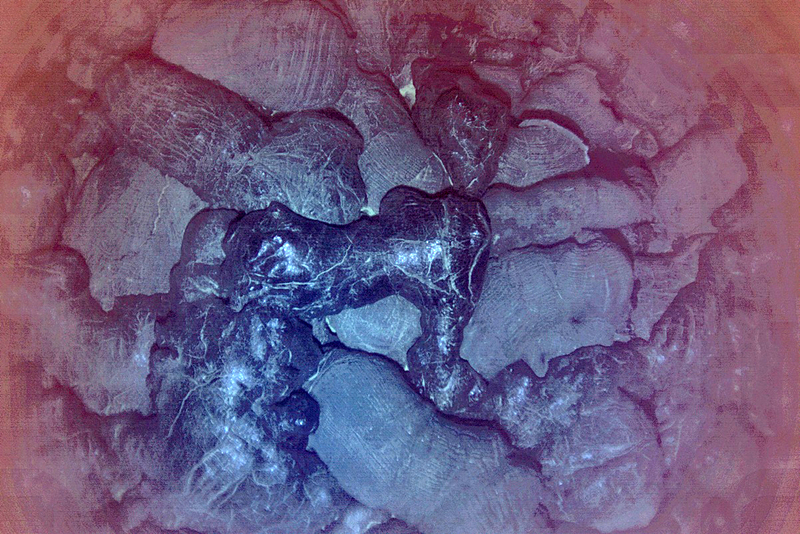 Image from the AUV Sentry of pristine lava flow with dark glassy pillow and lobate lavas with little or no sediment on them and over surrounding older seafloor (light material). Water depth was in excess of 4,000 m. From Merle and Chadwick (2016). 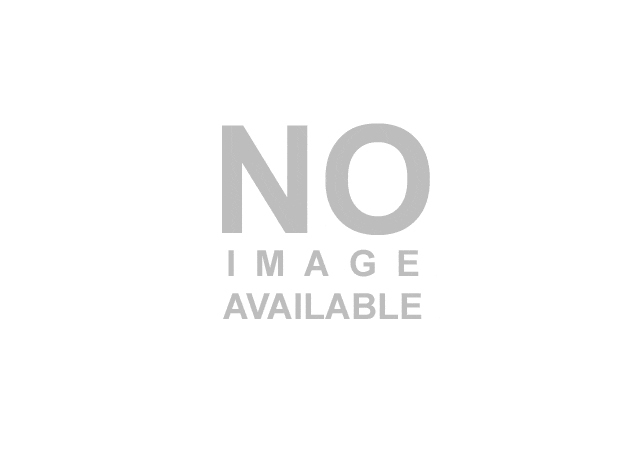 References: Merle, S., and Chadwick, W. (compilers), 2016, FK151121 - Hydrothermal Hunt on the Mariana Back-arc, R/V Falkor Nov 20 - Dec 17, 2015 Guam to Guam, Chief Scientists Joseph Resing and William Chadwick, Captain Heiko Volz, Operations with CTD casts and tows, AUV Sentry dives 366-370, and seafloor mapping with EM302 multibeam sonar, informal cruise report, 103 p.
Anderson, M.O., 2016, Structures and Predicted Geology of the Mariana Back-Arc, in Merle and Chadwick (2016), p. 81-99. Chadwick, B., and Resing, J., 2016, Expedition Summary, in Merle and Chadwick (2016), p. 2. Chadwick, B., Merle, S., and Anderson, M., 2016, Geologic Observations and Falkor EM302 Multibeam Bathymetric Mapping, in Merle and Chadwick (2016), p. 78-80. The Global Volcanism Program has no Weekly Reports available for Mariana Back-Arc Segment at 15.5°N. The Global Volcanism Program has no synonyms or subfeatures listed for Mariana Back-Arc Segment at 15.5°N. A series of very recently erupted lava flows were discovered in late 2015 along the Mariana back-arc spreading zone about 130 km WNW of Saipan. The flows near 15.4°N were not present at the time of a February 2013 bathymetric survey. Large hydrothermal plumes and intense chemical anomalies in the ocean overlie the area. The sediment-free pillow lavas have a dark glassy crust at water depths of between 4,100 and 4,450 m, believed to be the deepest historical eruption known, and the first to be found along a slow-spreading ridge. This location, the segment centered at 15.5°N, is part of a line of recently surveyed spreading segments with anomalous hydrothermal plumes. The line parallels the Mariana Island chain (about 100 km E) and the Mariana Trench (about 300 km E). Schmidt Ocean Institute, 2015. Hydrothermal Hunt at Mariana - Cruise Log. URL: http://www.schmidtocean.org/story/show/4598 (Accessed 8 January 2015). There is no Deformation History data available for Mariana Back-Arc Segment at 15.5°N. There is no Emissions History data available for Mariana Back-Arc Segment at 15.5°N. The Global Volcanism Program has no photographs available for Mariana Back-Arc Segment at 15.5°N. The Global Volcanism Program has no maps available for Mariana Back-Arc Segment at 15.5°N. There are no samples for Mariana Back-Arc Segment at 15.5°N in the Smithsonian's NMNH Department of Mineral Sciences Rock and Ore collection.